Last week’s theme for the roughly 4,000 shares of Smart Home conversations is the struggle to make the Smart Home practical. On the downside, the most highly shared link was that of a Smart Home zealot and second was a cartoon lampooning security in the Smart Home. Contrasting the over-the-top nature of Simeon Tuitt’s house and the negativity of this cartoon were stories about a highly practical product for families and efforts by the insurance industry to push the Smart Home. It is this type of conversation that helps move the narrative forward towards a broader adoption. This quaint looking neighborhood home in the middle of the UK belongs to Simeon Tuitt. His website contains videos describing how the TV turns on when he walks in the house, how he can answer his doorbell with his watch and even turn on the washer with his phone. Those are a few of the more practical aspects of Simeon’s domicile. With over 170 shares, there is interest out there, but I question the practicality of this futuristic Smart Home. I have to admit that this cartoon is pretty amusing. With 150 shares, it appears that I am not alone. This post from B2B Social Media consultant Evan Kirstel does a pretty good job turning security concerns into humor. I do wonder whether or not this type of posting subtly works against Smart Home adoption. Security is a very serious concern and by playing on that fear, I worry that the average consumer will needlessly worry. Perhaps I am reading too much into it because the comic is quite funny and I’m not sure my “smart broom” will be a security concern in the future. About a month ago, a small company by the name of Nucleus received over $5M of Series A funding, including an investment by Amazon. 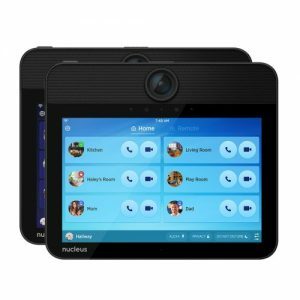 It is no surprise then that Amazon posted this very good discussion about the Nucleus Anywhere Intercom and it was shared 125 times. I encourage you to check out the wonderful video in that link. Imagine having an intercom at your parents’ house, the kids playroom, your office, and the kitchen. Now imagine it with Alexa voice control. In addition to being sold on Amazon, this product is being sold in Loews as an alternative to expensive “standard” intercoms. It is exactly this type of appeal – to the less technically savvy consumer – that will help to drive Smart Home into the mainstream. The marketing of this device (think about the name of the company alone) seems to be fantastic. We’ll have to watch the consumer reviews in the Argus Analyzer to see if the product lives up to the brand promise. Sticking with the theme of making the Smart Home practical, this picture is a model home that insurer American Family uses to test out Smart Home products. In this highly informative article from MIT Technology Review, Stacey Higginbotham describes how both USAA and American Family have initiatives to drive Smart Home. I love the quotation from an assistance VP at USAA. According to Mr. Kowall, they are creating a “check engine light for the home.” Again, an example of the practical aspects of life that will push the Smart Home mainstream.